Seeking to cut the postoperative mortality rate in the Glasgow Royal Infirmary, Lister revolutionized surgery with the introduction of carbolic acid (phenol) as an antiseptic. Inspired by Pasteur, who claimed on the basis of experimentation that fermentation and putrefaction were caused by minute living organisms in the atmosphere, 'germs', Lister reasoned that if microbes could cause infection, they could be killed before reaching the open wound. His use of carbolic acid on dressings and instruments, as well as on surgeons and patients, resulted in stunning results. The mortality rate among his amputee cases fell from 45 percent to 15 percent. "This development is probably second only to Pasteur’s contribution to the saving of human lives". In 1867, Lister published a series of papers in the Lancet describing his system of antiseptic surgery. Lister proposed a chemical barrier between the wound and the atmosphere in the form of carbolic acid, which Lister introduced into the wound with an additional layer of carbolic soaked lint. In the first series of Lancet papers, Lister reported on eleven cases of compound fractures of which nine recovered. He continued throughout his working life to experiment with other chemical antiseptics, with carbolic sprays for the surgical environment, with appropriate dressings, and to argue for medical practice based upon experimental procedures. Lister retired in 1892, by a man honoured for his contribution to medicine in 1883 by a baronetcy and later, in 1897, by a peerage (Baron Lister of Lyme Regis) and, in 1902, by the Order of Merit. Born 5 April 1827, England. 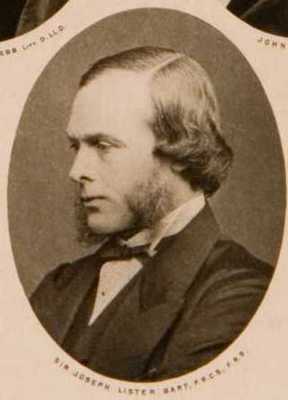 Joseph Lister, Baron Lister (1827-1912), developed his revolutionary system of antiseptic surgery while Professor of Surgery at the University from 1860 to 1869. Lister House Hall of Residence is named for him. Lister was born in Essex and became a surgeon in 1853. He became visiting surgeon at Glasgow Royal Infirmary in 1861, the year after he became Professor of Surgery at the University. In 1865 he began experimenting with the use of carbolic acid as a barrier against infection in cases of compound fractures at the Royal. In 1869 Lister left Glasgow to become Professor of Clinical Surgery at the University of Edinburgh. Eight years later he was appointed Professor of Surgery at King's College, London. He was awarded a peerage in 1883. Lawrence, Christopher. 2004. 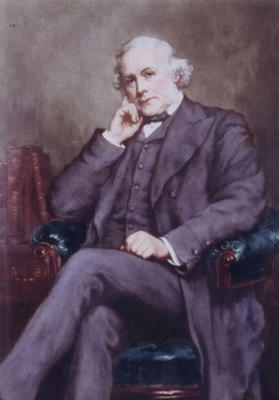 Lister, Joseph, Baron Lister (1827–1912), surgeon and founder of a system of antiseptic surgery. Oxford Dictionary of National Biography. Harding-Rains, A. J. 1977. Joseph Lister and antisepsis. Hove: Priory Press. Lister, J. 1867. Antiseptic principle of the practice of surgery. British Medical Journal. 90: 2299. World Changing Project, "Introducing anti-sepsis in the operating theatre," in University of Glasgow World Changing (University of Glasgow, 2010); http://www.worldchanging.glasgow.ac.uk/article/?id=91 (accessed April 26, 2019). World Changing Project. "Introducing anti-sepsis in the operating theatre." In University of Glasgow World Changing. University of Glasgow, 2010. http://www.worldchanging.glasgow.ac.uk/article/?id=91 (accessed April 26, 2019). World Changing Project. "Introducing anti-sepsis in the operating theatre." University of Glasgow World Changing. University of Glasgow, 2010. 26 April 2019 <http://www.worldchanging.glasgow.ac.uk/article/?id=91>.